While living on Okinawa I practiced for some time in the style called Mukenkan. This school was established by Gushiken Shijin 具志堅私人 (1944–1998). The following are some information I collected from two handouts I had been given by Sawada Kiyoshi sensei, one of Gushiken’s students, plus from what I saw, oberserved, and practiced. 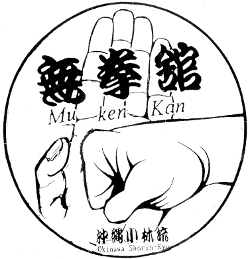 The emblem of the Mukenkan. Gushiken began his training in karate at the age if eight. He intitially studied Gōjū-ryū. At the age of ten years he became a student of Higa Yūchoku sensei of the Kyūdōkan. In 1967, at the age of 22, Gushiken received the certificate of mastership (shihan menkyo 師範免許) by Higa sensei. In 1969, at the age of 24, Gushiken opened the Mukenkan 無拳舘 dōjō in Naha City Kainan, where he taught about 1000 students in total. 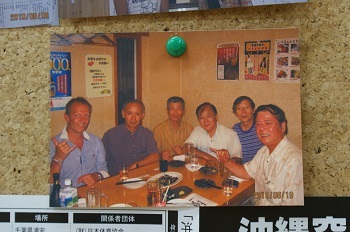 By the end of the 1990s, the Mukenkan was located in Naha City Yorimiya, where mainly higher ranked persons were taught. During the end of his karate career Gushiken Shijin was ranked Hanshi 9th dan. At the center of training are Muken-uke no Kata 無拳受けの型, Seme no Kata 攻めの型, Tenshin 転身 and others. Above mentioned Muken-uke no Kata reminded me of Gōjū-ryū’s Tenshō and might as well have been inspired by it, but also includes defenses against lock-kicks etc. The current HQ is the dōjō of Akamine Hiroshi sensei, located in Tomigusuku. He als has a blog about Mukenkan, and here is a photo I took during a training session. It is the same dōjō where Akamine sensei also teaches Ryūkyū Kobudō Shinbukan. We should not use karate as a means of seeking publicity or fame. We pursue the correct path of karate that is the art of self-defense. A karateka must place the stability of life, economy, and family as top priorities. A karateka must always have fortitude, and must be unshakable. We must refrain from demonstrating in public. We must always polish our minds, and surpass the conspiracies of wicked people. We should respect our seniors and cultivate our juniors. Karate is a martial arts for ladies and gentlemen who are well-versed in the proprieties of social conduct. Karate-do is a way of life, therefore, we should not seek a flowery living but a substantial way of life. A karateka who is all talk and no action, who knows only theory and who only writes about martial arts, is nothing but an empty person. One who neglects training is a person of all talk and no action, a disgrace to karate and to his own spirit. The martial art of karate should be carried out for a lifetime. When one releases his last breath, his defense of body and soul can also be released like the cherry blossoms blown in the wind. At a Mukenkan meeting, to which the members kindly invited me. Much later I came across the copy of an article written in the fall of 1992. It was published in a magazine or journal but I couldn’t figure out so far what magazine excytly this was. It was written by Hilda O. Weiss on account of a visit she made together with Dr. Bernie Weiss to the Mukenkan of Gushiken Shijin in Okinawa in 1992. At that time, it was Takayoshi sensei who did the translating for the visitors. Obviously the explanations on karate were done by both Gushiken and Takayoshi sensei. 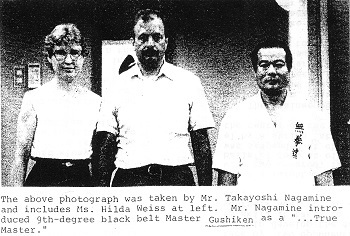 Both Gushiken and Nagamine agreed that when teaching karate, it is very important to have students learn the basic technique (i.e., moving out of the attacker’s reach) before progressing to techniques that require more skill. “Karate is a martial art for everyone – young, old, men, women. Karateka should respect people who practice seriously. Good students should be happy to lend a helping hand to juniors,” Gushiken said. “But sometimes it is good to demonstrate advanced techniques. Karateka must always strive to improve. It is good to see what you’re striving to achieve,” Gushiken told us. To demonstrate timing and connection, Gushiken asked Bernie for a fast punch to the stomach. Three, four times the punch thrust into him and each time with the same, almost motionless, move he guided it a inch past his gi. “You must learn to see the punch coming in slow motion so you can be still until it almost touches you,” he told us. With timing perfected like this and combined with precision and connection, he explained, you can use karate to defend yourself whether you are 16 or 60. At this level of skill you no longer depend on strength or agility. “Karate trains the whole body, especially the mind,” he said. At the end of the demonstration, Gushiken showed us training devices he has invented for close in and distance work on precision and timing. He used a very simple tool to simulate an attack by two opponents and to help develop the advanced skill it takes to defend yourself against two attackers. A straight bamboo stick with two covered, fist-size balls of foam at either end was suspended at chest level by a string attached to the center of the stick. The trainee punches one ball of foam causing it to fly away from him as though it were a real-life opponent. However striking the first body causes the other one to move toward you. “Just like in real life, if two attackers are working together and you strike one of them, you have to be prepared for the other one to attack you,” Gushiken explained. The trainee’s goal is to strike each ball solidly as it flies toward him. 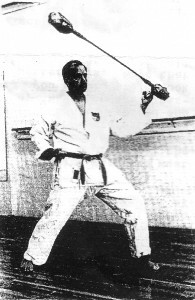 Gushiken Shijin invented the training tool shown here by Dr. Bernie Weiss. Gushiken sensei explained the construction, and demonstrated the use, of this training aid to Bernie and Hilda Weiss during their stay in Naha, Okinawa. Bernie Weiss made several of these, varying in size and weight, for use by his Topanga-Valley Karate School students. With this device, Gushiken showed us, a shorter stick simulates attackers who are closer and faster. A longer pole helps you prepare for distance techniques. Also the height of the rod can be adjusted to train against face or stomcah level punches. The rod can be lowered and the trainee can work on leg moves to defend against knee and groin level kicks. Likewise in sparring or in the street, if you look at the throat level of your opponent, you can watch his breathing and at the same time have a sense of where his hands and feet are at all times. Technique, as they showed us, is never completely mastered. There is alwys room for refinement and the need to perfect the skills one has learned. That is why karate is an art that can be practiced for a lifetime and, as in Okinawa, for centuries. Actually, Akamine Hiroshi sensei had that same tool in his dōjō and played it on various occasions. I remember he also had it hanging in the timberwork of his private home. It also inspired me to create the “Bozooka” for weapons training. In conclusion, this tool is very cool. Altough it is usually not seen among the lists and descriptions of Okinawan practice equipment, it might be a nice addition, and one you can use anywhere and with just little time. This entry was posted in Misc and tagged Gushiken Shijin, Mukenkan. Bookmark the permalink.